...certain oil fields in places like Iraq and Saudi are still pulling oil up at a cost of about $10 per barrel. The first table comes from the USEIA. 15,618 cubic feet of natural gas equivalent to one barrel. 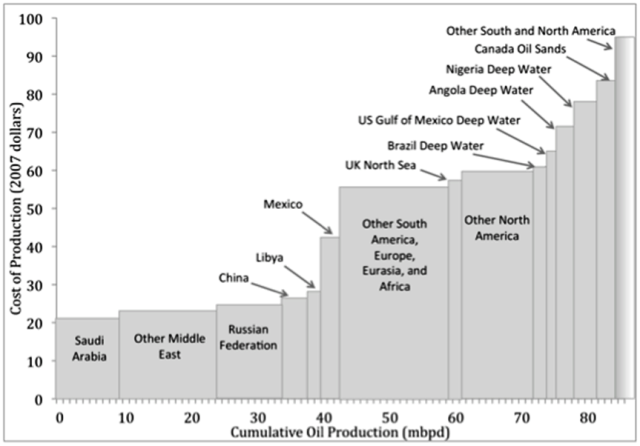 Source: Tables 10, 11 and 12, Performance Profiles of Major Energy Producers, 2009. The net quantities of oil and gas produced and sold by us for each of the three fiscal years ended December 31, the average sales price per unit sold and the average production cost per unit are presented below. Barrels of oil equivalent have been calculated on the basis of six thousand cubic feet (Mcf) of natural gas equal to one barrel of oil equivalent (1 BOE). Notice that as the price of oil goes up, the cost of production per barrel also goes up -- due to automatically increased tax rates. Also notice that the cost of production given by GEOI is much lower than the $60 to $80 per barrel prodution cost usually quoted for tight oil. This graphic is a big picture comparison of different regions and countries. Better technologies for tight oil, oil sands, and other unconventional oil production, are pushing production costs down -- while prices seem to be stuck on an undulating plateau. Clearly the Persian Gulf countries are sitting in the best seats in terms of watching the oil money flow in. Russia is not doing too badly either -- if not for corruption in high places, stripping away oil profits for wasteful personal consumption by cronies. The best North American oil producers are enjoying a profitable season, and are happy for it. Even if oil prices drop to $60 a barrel, many of the North American producers will be able to keep producing long enough to wait out the slump, and catch the ride back up. The problem with the chart is to understand how 2007 US$ correlate with US$ 2013. This is needed to correlate the current costs with the current prices. This economic crisis could reduce oil consumption enough to drive the price down to 2007's 60 US$. This would destabilize many oil producer countries, because without oil revenues they are not able to bribe their populations to stay submitted. In particular, if oil revenues go down, Saudi Arabia will have political turmoils and Egypt will become a political nightmare because it will be totally unable to pay for food imports (it is already on the edge). The value of the US$ is rapidly declining under Obama. And as you say, the issue of fiscal breakeven is just as important to oil - dependent states as is the issue of production costs. For this posting, I chose to focus exclusively on production costs in order to get a clearer picture of that issue in isolation. But as you say, for governments which depend upon oil revenues to pacify their populations -- such as the OPEC states, Russia, etc. -- fiscal breakeven cannot be ignored. If Oil Prices Drop Below $80 a Barrel . . . .